When the Norwegian Cancer Society redesigned its website in 2012, the results were illuminating. By increasing its focus on the “user experience” (UX) of its website and mobile channels, the charity doubled the regular one-off donations generated online, tripled its new regular donors, increased its membership by 150 per cent and quadrupled the annual value of its regular donors. The NCS had been putting the process off for years. Like many charities, it had long assumed there was little point in putting resources into its website because it brought in so few donations. But according to the digital fundraising consultant Beate Sorum – who worked with the charity for six years and launched her own consultancy, b.bold, in June – the reason was not that donors didn’t want to donate online; it was that the website was putting them off. The NCS is not alone: a survey by the not-for-profit IT provider Eduserv concluded in July that the charity sector as a whole was still failing to maximise fundraising through websites and mobile devices. Twenty of the 50 charities that responded to the survey said they did not optimise their donation platforms for mobile devices in any way. Other issues deterring donors included poor accessibility and website speeds, complicated donor journeys and limited donation options – for example, ones that excluded PayPal and giving by text. According to the study, environment and health charities had the least donation-friendly websites, and animal charities performed best. The cardinal sin that many charities commit, according to Julie Dodd, creative director (UX & design) at the digital agency Zone, is generating a willingness to make a donation but then making the process so difficult that they don’t end up getting the money. “Charities need to get donors through their journeys as quickly as possible,” she says. “You can’t be scaring them off with terrifyingly long terms and conditions or a badly worded Gift Aid message.” Charities such as theWellcome Trust, Cancer Research UK and Leukaemia & Lymphoma Research, which employ staff specialising in UX, appear to have the right idea. A report by the software company Blackbaud found recently that the average online donation to charities across the board had risen by almost a third over the past four years, from £52.87 in 2010 to £69.70 last year. Online giving is tipped to become the most popular way of donating money one day, so any charity that doesn’t make its donation systems easy and user-friendly needs to address the problem urgently. 1. Improve the structure and content of donation forms. Change buttons so they say what they actually do – instead of having a “Submit” button, have a “Become a member” button, a “Donate now” button or a “Sign me up” button. Get rid of the “Cancel” button, because people can just leave your web page if they want to. Consultant Beate Sorum says charities should also make sure fields in forms have a length appropriate to the content to go in them, because this makes them easier to read and people make fewer errors. It should be clear which fields must be filled in and which are optional. If someone makes a mistake, an error message should come up at the top of the page in the same colour as the error, which should be highlighted in the form. 2. Get the coding of donation forms right. Ida Aalen, a senior interaction designer at the Norwegian UX consultancy Netlife Research, says this is something to nag your web developers about. Forms that are coded correctly work better on mobiles and tablets and are more accessible to people with disabilities. Well-coded mobile forms will have the numbers come up when donors want to enter their phone numbers and the @ symbol when they’re entering their email addresses. “This is very important if you want to increase donations made by mobile and tablet,” says Aalen. 3. Don’t be a slave to the database. Far too often charities include fields in their donation forms because they’ve been created by web developers who see that there’s a field for that information in the database. Studies have shown that every extra piece of data you ask for decreases your conversion rate: when the Norwegian Cancer Society reduced its donation forms from 11 fields to four, the number of completed forms increased by 140 per cent. 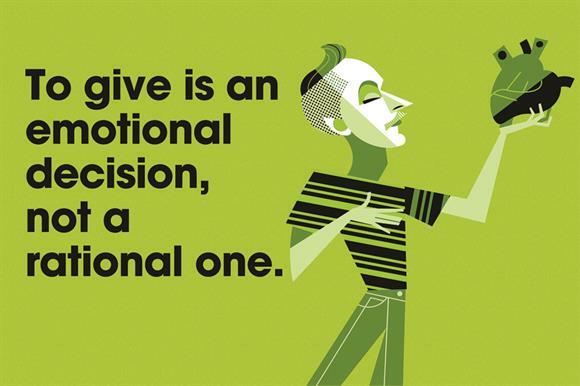 Experts say this is because making a donation is an emotional decision, not a rational one. If you start making people use the rational parts of their brains, you’re going to lose their gifts. A good example is Macmillan‘s website, which in the bereavement section offers users the chance to set up legacy funds. 5. Use smart defaults. The NCS found that a lot of the donations it was getting were larger than the default amount requested on its donation forms. When it changed this from about £25 to £50, people started giving more. “We had campaigns where we were asking people for too much, which hurt conversions, so you need to test what is appropriate for each context,” says Sorum. It also had a positive impact when NCS changed its default donation type from one-off to monthly and used the same form for both donation types. 7. Choose your payment provider carefully. A big factor in people dropping out of donation processes is their impatience at having to re-enter the same details a second time when they go through to the third-party payments page. In an ideal world, charities would build their own payment systems; but the costs mean this isn’t an option for most, so it’s best to be discerning and demanding of the third party you work with. Make sure their developers are analysing data so that any details donors have already added are transferred automatically. SMX Milan 2015: con lo sconto del 70% è davvero imperdibile !